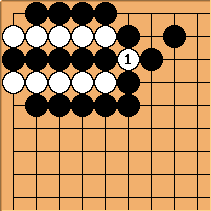 At the 2007 US Go Congress, while waiting for Yu Ping to arrive and present his talk on computer go, two AGA 3 dans placed a tsumego problem on the demonstration board. The problem arose in the midst of their game. During the game the player took several minutes to read out the problem. When Yu Ping arrived, he looked, smiled and turned to audience after having read out the solution in less than 10 seconds. 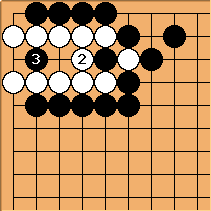 Yu Ping explained that tsumego problems demonstrate a method of living or killing. Sometimes several methods are required in sequence. He said he was able to solve the problem quickly because he recognized the method required. At that point, he read quickly to verify that the method worked. This is a different way of looking at tsumego. Rather than treat the problem as a reading exercise, a set of heuristics can be applied to problem searching for one that works. The method for the problem at the Go Congress was capturing five does not make two eyes. Yu Ping explained that the five stones could form a straight line or have a single bend at one end, no difference. Needless, to say the problem at the Congress was more complex. Several moves were required to force White to create the five in a row shape.